6 Common A and common B are held apart and not connected to anything. A+,A-,B+,B- to bipolar driver with 41% higher voltage than the motor rating. 8 Connect A coils in series (A+' to A-'), and B coils in series (B+' to B-'), then A+,A-,B+,B- to bipolar driver with 41% higher voltage than the motor rating. 8 A coils in parallel (A+ to A-, A+' to A-'), B coils in parallel (B+ to B-, B+' to B-'), each set (A+/A-, A+'/A-', B+/B-, B+'/B-') to bipolar driver with 41% more current capacity than the motor rating. Note: The above is peak current, not the average current needed. And only when going from nothing to full power. The power required to run is less than to start. See Stepper Motor Driver Power Supplies for more on actual power requiements. Bipolar drivers can recirculate some of the power out of one coil, into the other, when changing from step to step. This reduces the power required to drive the motors by 20 to 80%. Unipolar motors don't have that advantage. But that is related to the supply current, not the peak current moving through the coils and driver. Keep in mind, the power out of a motor pretty much equals the power in. In electronics, power (in watts) = voltage times amperage. If you run a unipolar motor at 5 watts (e.g. a 5 volt 1 amp) and a bipolar motor wired parallel at 5 watts (e.g. a 5 volt 1 amp motor running parallel at 3.5 volt 1.4 amp) you are going to get about the same torque from each. There is only one coil wound bifilar on the same core. if you connect both starts and ends respectively the only thing you are doing is doubling the wire's effective transversal section (reducing the coil resistance ) versus the unipolar. Number of turns is still the same. And Holding torque equals Ampere-turns. So when you are trying to get the best bang for your buck, and you include the cost of the driver, and the requirement for an 8 wire motor, you can probably get a unipolar driver with the same power rating as a bi-polar driver for less money and put that savings into bigger unipolar motors. On the other hand, if you find a killer deal on some 8 wire motors, you will probably get better low end torque if you spend the extra on a parallel bi-polar driver. And if you include the price of a standard power supply, the cost advantage swings back to bipolar. So for unipolar drivers, use battery stacks with low current re-chargers. Here is a real world example that illustrates this point: The Vexta PK266-02B motor is commonly available for around $30. It is a 6 wire motor, so Parallel Bipolar is not an option. Starting from the datasheet provided by the mfgr for the motor, we can take the unipolar torque curve shown on the right, and cut out the part up to 500 RPM (since that is all they provide on the other, bipolar, graph) then turn the line on the unipolar side green (to make it easier to see) and resize it on top of the bipolar graph. You see the result on the left. The bipolar driver, starts out with more torque, but looses power quickly as the RPM climb. On a CNC mill, this limits your traverse speed, although it does give you better cutting drive. 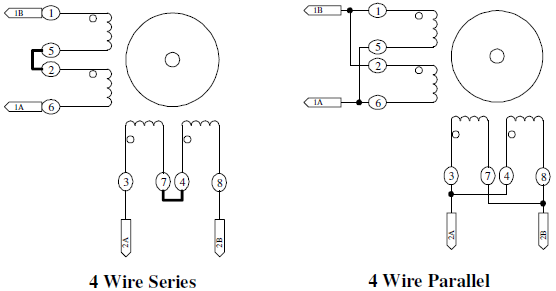 Wiring for information on the different types of wiring inside a stepper motor and finding which wire is which. http://www.designworldonline.com/articles/3807/21/Improving-High-Speed-Performance-of-Hybrid-Stepper-Motors.aspx Interesting comparison of the different methods of improving high speed performance of hybrid stepper motors. Of most interest is the finding that bi-polar parallel produced almost half the torque of bi-polar series at low speeds. This is contrary to the expected result. http://www.linengineering.com/LinE/contents/stepmotors/5718.aspx Lin Engineering does a good job of providing graphs showing the expected speed vs. torque curves for thier motors in parallel and series bi-polar configurations.